Ipplepen lies south west of Newton Abbot . A recent archaeological dig has brought it into the limelight;the ungoing archaeology is rewriting the history books,suggesting that Ipplepen was Romanised as early as 50 AD,ie a year after the Romans settled in what is now called Exeter. Conan Doyle visited his friend at Ipplepen who gave him the idea of the Hounds of The Baskervilles. 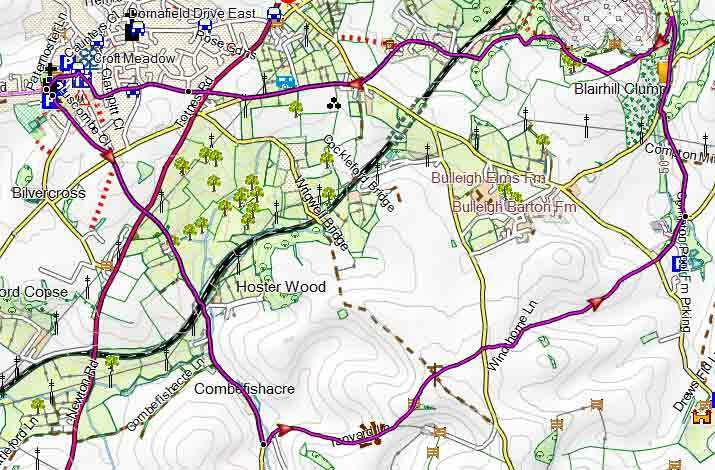 This quite challenging walk follows green lanes,paths and bridlepaths. A busy road has to be crossed twice. This walk is not suitable for young children or anyone lacking a degree of flexibility. However,it does run through some of the most beautiful countryside in Devon,particularly during the summer with an abundance of wild flowers. At Combe Fishacre it steadily climbs up an old track,Tanyard lane (once leading to a tannery? ),and continues via Windthorn cross,along an old mill leat passing the well known Bickley Mill Inn. Both lanes date back to the middle ages.or even before - its surface in places poses a bit of a challenge. After heavy rain patches can become quite muddy. Once at the top. the views of Dartmoor are quite spectacular. In the distance,you can see an old windmill which seems to act as a beacon. It returns along part of Stoneycombe quarry.You can see the unique pink limestone from a specially built platform. Stoneycombe is noted for an unusual species of whitebeam. Once you have crossed the busy road for the second time,you pass the site where a small Roman settlement & road was found (on left past farm yard). 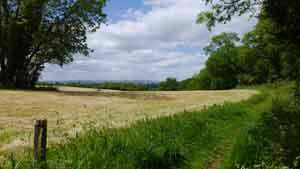 A wide variety of popular walks exploring the countryside surrounding Newton Abbot. Town Trail & Popular Circular Pub Walks around Totnes and along the river Dart. Two great walks from Marldon to Berry Pomeroy Castle through rural countryside which has changed little since the middle ages. This pleasant walk passes two historic pubs and follows public foot paths and fairly quiet lanes. From the small car park turn right and take a lane to Torbryan. 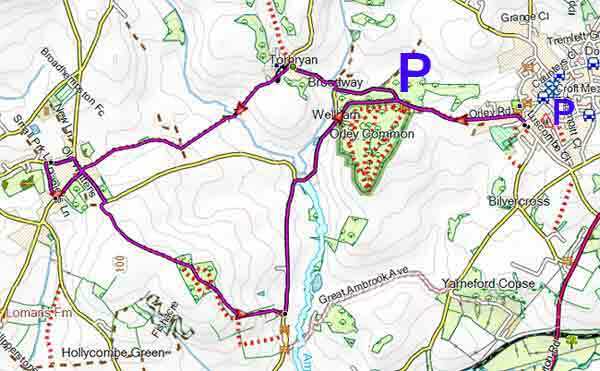 Alternatively,you can park residentially in Ipplepen and walk to the starting point using a foot path parallel to the lane out of Ipplepen.- this would make the total distance around 4.9 miles. 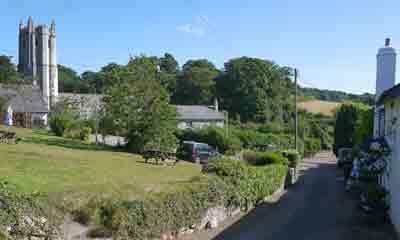 Small Car Park in forest,see map or Residential in Ipplepen.